Every day, a row of metal pans sit side by side on two long tables. Each is filled with an Indian food specialty. Two are filled with appetizers. One contains biryani, another curry, and yet another, chicken tikka masala. Next is a vegetable offering. Last, the dessert, familiar to one and all, rice pudding. That’s a description of the lunch specials at the Indian Gate Restaurant on Main Street in Paterson. Owner Maria Liza has operated the new eatery for two months. “Before there was a Turkish restaurant here,” said Liza. Her restaurant is in a predominately Middle Eastern neighborhood. That hasn’t stopped her from attracting customers from near and far. Mayor Andre Sayegh, an occasional food critic on his popular Facebook page, recently ate with his family at the Indian Gate Restaurant. He gave the new establishment a rave review, describing it as unlike any other eatery in Paterson. Those unfamiliar with Indian food have at hand the aid of a detailed tri-fold menu containing description of every dish. One of the most popular entrees is the traditional biryani, a spicy rice dish mixed with meat such as chicken or shrimp. It’s made with aromatic Basmati rice at the restaurant. The reasonably priced menu also features goat, lamb, and chicken curry. The all you can eat special is for a price of $12.99. “Lately, the number of customers coming in have increased,” said Liza. Her establishment has an intimate setting marked by a bright ambiance of red wallpaper with goldish tint. There are comfortable booths and long tables with elegant chairs. Wall niches display beautiful white and blue vases containing colorful flowers. A screen perpetually plays Bollywood music videos. The idea for the restaurant sprang from her love of spending time in the kitchen. “I love to cook for myself but I love to cook for other people even more,” said Liza, 24, taking a break from her culinary responsibilities. Despite earning a degree in computer networking, Liza said her first love is still in the kitchen. 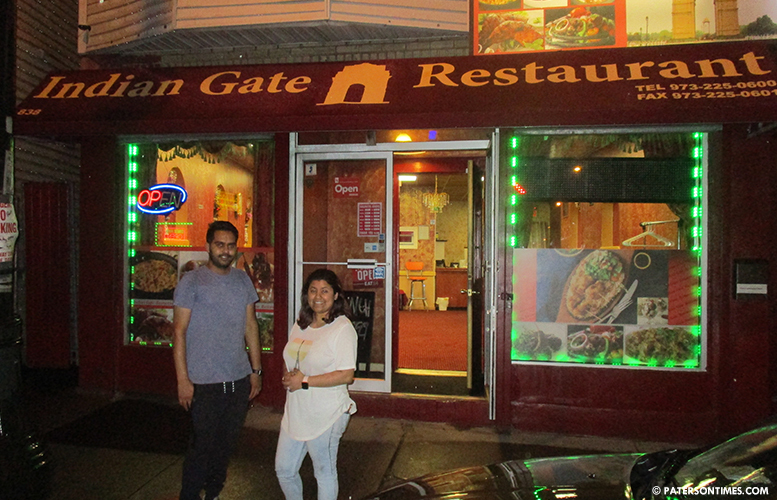 She lends a hand to the chef in the kitchen, but the businesswoman also handles customer relations at the Indian Gate Restaurant. Part of her job includes explaining some of the dishes. 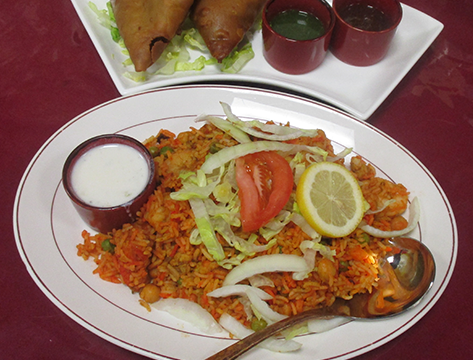 Chicken and shrimp biryani, a popular dish at the Indian Gate Restaurant. Lamb, goat, and chicken are marinated for a full day for flavor. The meat is soaked in Indian seasoning and yogurt, she said. Although she is running an Indian restaurant, her family hails from Bangladesh. She used to live in Queens, but now commutes from Jersey City to the Silk City. She explained the culinary difference between the two neighboring countries. “Northern India’s specialty is biryani,” said Liza (pictured above). “The food known best in Bangladesh is fish. Someday, I would like to open another restaurant which specializes in food from Bangladesh.” She may have found the right city, Paterson has a rapidly expanding Bengali population in the Totowa-Hillcrest area. Head chef Harineer Singh is comfortable preparing North Indian dishes. He is from Punjab in India. “When I came to America, I learned how to cook a little in high school and more in college. My favorite dish to cook is chicken tikka masala,” said Singh, pictured above. Chicken tikka masala is sliced, roasted chicken sautéed with bell peppers and onions. He prepares a variety of other viands. Many kinds of soups — tomato, mulligatawny, chicken, hot and sour, and sweet corn vegetable. Among many appetizer choices are tikki chaat — potato pastries covered with chickpeas curry and sweet and sour sauce. Another choice is Paneer Pakora — bite-sized sliced pieces of Indian cottage cheese, batter fried. 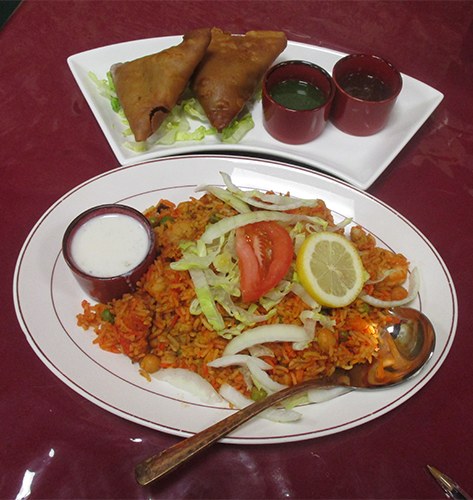 Non-vegetable appetizers include shrimp or fish pakora and the chicken kathi roll. Paneer also crosses over into a variety of main entrees. Paneer is a soft, unsalted cheese made famous in India. It is made from milk that is simmered and curdled using lemon juice, vinegar, or yogurt. Grilled delights include malai kabab-chicken cubes marinated in sour cream with cream cheese and Nowabi fish tikka/shrimp. The latter is northern style salmon fish with shrimp which is cooked in a clay oven. Vegetarians need not worry as a plethora of tasty vegetable dishes are offered. Indo-Chinese options are also on hand, including gogi manchurian and vegetable noodles. In addition to the rice pudding, the gulab jamun and rasmalai desserts are available. The former is golden brown donuts dipped in sugar syrup. Rasamalai is sweet cottage cheese dumplings in milk. The restaurant has an outside dining option and offers outdoor hookah smoking. The eatery is open six days a week from 11 a.m. to 10 p.m. It is closed on Tuesdays. Lunch buffet is from 11 a.m. to 3 p.m.
Visit the Indian Gate Restaurant website for menu and more information.